A few weeks ago, I could only have given the haziest definition of what “metadata” is if I was asked. Thanks to the electronic surveillance disclosures of Edward Snowden, the word is heard everywhere. “Metadata” should resonate very loudly with journalists. When Snowden released clues about the scale of surveillance conducted by the NSA, GCHQ and allied cyber-snoopers, it was quickly made clear this was – mostly – who called or emailed who, when and from where. So-called “metadata”. The actual content of the communications isn’t, apparently, collected and stored in huge industrial quantities by the governments doing this. It took me a embarrassingly long time to work out that while this form of information collection may be useful for tracking people who might want to kill people, it is also perfectly adapted to tracing journalists’ sources. Data which tells someone who called who and when is enough to provide very strong clues about who is providing information to whom. No need for any government agency to be so intrusive and unsubtle as to listen in to the conversation itself. You would have been hard put to be reading this blog in the past few weeks and succeded in avoiding any mention of my book Out of Print. This post is yet another encouragement to buy a copy by rounding up some of the stuff I’ve done about it and a few reviews. 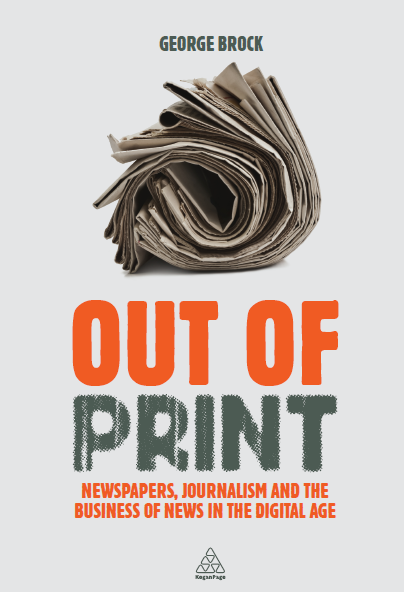 And the book is another instalment in my campaign to stamp out pessimism about journalism. For easy watching, there’s a BBC interview by Nick Higham here (I fear it’s available only outside the UK). I summarised the book’s theme and argument in a blogpost here and in a piece for The Conversation UK here. There are recent pieces connected to the book’s themes on “who’s a journalist?” in the Yorkshire Post and on spaghetti-throwing (or experiments) at local level at journalism.co.uk. There are a couple of online reviews here (Geoff Ward) and here (Roy Greenslade) and one in the News Statesman from Emily Bell of the Columbia Journalism School. Matthew Ingram of PaidContent assessed the book here. To complete the set here is one in Dutch by Bart Brouwers. I naturally hope that these only whet your appetite to read the whole thing….